Tokyo, Japan - Sony Corporation (“Sony” or the “Company”) today announced that it has achieved and/or exceeded the majority of the targets set out in its "Green Management 2010" (“GM2010”) mid-term environmental plan, including an over 30% reduction in global CO2 emissions across its business sites compared with fiscal year 2000 levels. Sony’ GM2010 plan, introduced in 2006, aimed to reduce the Company’s environmental impact over the five-year period spanning fiscal years 2006 through 2010. The results of these initiatives have been confirmed through third-party verification. 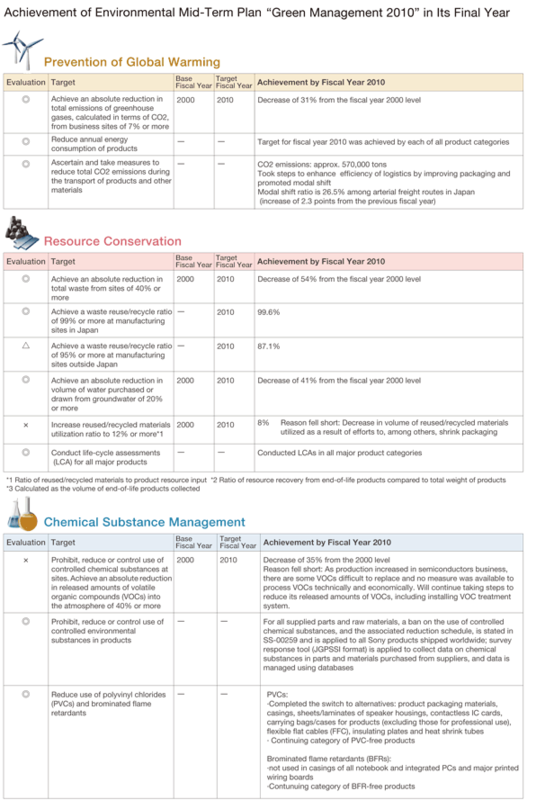 GM2010 included a series of aggressive greenhouse gas reduction targets. Through the implementation of various innovative initiatives designed to achieve these goals, Sony successfully reduced CO2 emissions*1 across its business sites to 1.53 million tons in fiscal year 2010. This represents a reduction of 31% compared to fiscal year 2000 levels, far surpassing the original 7% target specified in the GM2010 plan. Sony’s initiatives included the use of alternative substances to replace substances with high global warming potential in its manufacturing processes, and the reduction of energy-related CO2 emissions through the installation of advanced energy systems, which have been optimized by Sony’s in-house energy conservation specialists to deliver maximum energy efficiency at Sony offices and manufacturing sites around the world. Sony was also instrumental in the introduction of the Green Power Certification System for renewable energy in Japan, and remains one of its largest users. - Direct emissions: Emissions from combustion boilers, furnaces, vehicles etc. which Sony directly owns or controls. - Indirect emissions: Emissions that physically occur outside of Sony sites but are deemed attributable to the company, such as electricity purchases. Volatile organic compound (VOC) emissions from business sites - 35% reduction (target 40%) Semiconductors are the main area of production in which VOCs remain in use. With semiconductor production continuing to increase, some VOCs have been difficult to replace, while others emit such low levels of gas, it has proved difficult to implement technically and economically viable alternatives. Sony will continue to take steps to reduce its VOC emissions, including measures such as installing VOC treatment systems. For example, the annual electricity consumption of core “BRAVIA™” LCD TV models*2 declined by approximately 30% between 2008 and 2010, while the annual electricity consumption of Sony’s core “Blu-ray Disc™” recorder models*3 fell by approximately 50% during the same period. *2Comparison between “BRAVIA” V1 series (2008) and EX700 series (2010). (Both 40” and 46” models). Calculated based on the Law Concerning the Rational Use of Energy in Japan effective at the time of sale. *3Comparison between BDZ-T55 (2008) and BDZ-AT300S (2010) Calculated based on the standard issued by Japan Electronics and Information Technology Industries. Sony Europe has made consistent progress, with all GEMS *4-certified Sony sites throughout Europe being powered by electricity from 100% renewable sources*5 since fiscal year 2008. In terms of waste management, recycling levels have increased from 73% in fiscal year 2000 to 99% in fiscal year 2009, meaning that currently 99% of the waste generated by Sony Europe manufacturing facilities is either reused or recycled. In addition, as part of its measures to further increase producer responsibility, Sony Europe is also a founding member of the European Recycling Platform (ERP). Fully operational in 12 European countries, the ERP effectively manages end-of-life collection and recycling for all consumer electronics products across these countries. *4Global Environmental Management System. Sony’s global environmental management system based on ISO14001. *5Data for fiscal years 2008, 2009 and 2010 has been verified by leading global certification organization Bureau Veritas Certification (BVC). In the U.S., Sony Corporation of America, Sony DADC, Sony Electronics and Sony Pictures Entertainment came together to purchase more than 143 million kilowatt-hours (kWh) of green power annually for 2011, which is enough green power to meet an estimated 49 percent of these entities’ electricity use. In addition to its green power purchase, Sony is using various on-site solar installations as part of its shift away from traditional sources of electricity generation toward cleaner, renewable energy alternatives. Additionally, in 2010, both Sony Pictures Entertainment and Sony Electronics were awarded Leadership in Energy and Environmental Design (LEED®) Gold certifications from the U.S. Green Buildings Council for recently completed construction projects. SPE earned its certification for the studio's Lot and Office Transformation (LOT) Project, which included the construction of two new 100,000-square foot office buildings and a parking structure located at the heart of the studio's historic lot in Culver City, California, while Sony Electronics earned its certification for its new U.S. headquarters building in San Diego, California. Sony EMCS (Malaysia) Sdn. Bhd. - Kuala Lumpur TEC is working with its packaging manufacturers to recycle cardboard waste. Approximately 4,014 tons of this waste is reprocessed annually into new cardboard cartons for “BRAVIA™ “ LCD televisions, while approximately 817 tons are recycled into cushioning materials for DVD Players and Blu-ray Disc™ Players. Sony EMCS (Malaysia) Sdn. Bhd. - Kuala Lumpur TEC and Sony Technology (Thailand) Co., Ltd., in Ayutthaya and Chonburi have installed systems that convert food waste into biogas. This not only reduces quantities of food waste being disposed in landfills, but also lowers the carbon footprint of these facilities by reducing the amount of liquid propane gas (LPG) needed for cooking. In total, approximately 115 tons of food waste and approximately 19 tons of CO2 have been reduced annually. Sony Group companies in China have implemented various initiatives to purify, reduce consumption and recycle water, in order to preserve water resources. For example, in 2009 Sony Digital Products (Wuxi) (“SDPW”) installed a system to treat sewage for reuse in toilets at the site. In 2010, SDPW also introduced a recycling system which purifies industrial wastewater resulting from the manufacturing processes to a level that can be reused for manufacturing. While production in China increased significantly, Sony Group companies in China reduced their water use by approximately 800,000 tons during a five-year period, a reduction of approximately 42% over that period of time. Sony Korea Corporation has started a Zero Electronic Waste Program campaign in collaboration with the Korean Government and recycling companies, signing a memorandum of understanding (MOU) with the National Council of Green Consumers Network in Korea. To enhance this campaign, Sony Korea also developed educational programs for students and their mentors, enrolling students from 100 schools to collect electronics waste for recycling purposes, and to communicate the importance of recycling to their friends and surrounding communities. In Japan Sony has focused on the introduction of eco-conscious products and the development of environmental technologies. In 2009, Sony introduced its “BRAVIA™” V5 series, the industry’s first consumer LCD TV incorporating a presence sensor*6, and has since incorporated this feature in many subsequent models. In 2011, Sony introduced “BRAVIA™” EX52H, using “SoRPlas”, a Sony-developed original recycled plastic material containing over 99% recycled materials, for the TV bezel. While Sony has continued to provide a wide variety of eco-conscious products for consumers around the world, the Company is also committed to developing next-generation energy technologies, including dye-sensitized solar cells and bio batteries. In 2009, Sony started mass production of mercury-free alkaline button batteries and, in April 2011, announced shipments of energy storage modules using rechargeable lithium-ion batteries made from olivine-type phosphate. Since April 2011, Sony has been working on a new range of initiatives to achieve the targets set forth in its “Green Management 2015” (“GM2015”)*7 program, the successor to its GM2010 plan. The GM2015 targets correspond with Sony’s “Road to Zero”*8 global environmental plan – which includes the long-term vision of achieving a zero environmental footprint by 2050 – and have been calculated back from 2050, to determine specific mid-term environmental targets for the next five years in line with that goal. Furthermore, specific targets have been set for each stage of the product life-cycle, from R&D to product recycling, to ensure the achievement of the next set of Sony mid-term environmental goals. *6Presence Sensor automatically turning off the picture when no one is present in the vicinity after a user-set timeframe. When the sensor detects motion, the TV turns itself back on instantly.